My first trip to New England is over and I already want to go back! This beach girl misses her ocean, but that is just one of the reasons I had a fabulous vacation in Kennebunkport Maine. 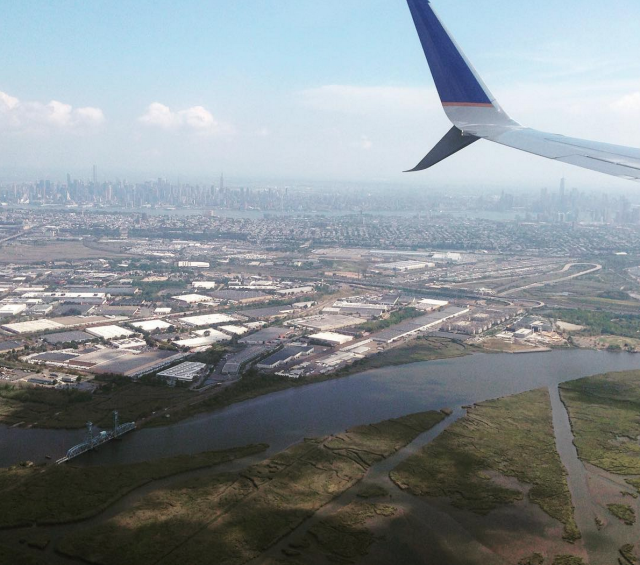 My layover was in NJ and so guess what I spied out my airplane window? NYC! I even spied the Statue of Liberty though she was so tiny out there. ha! 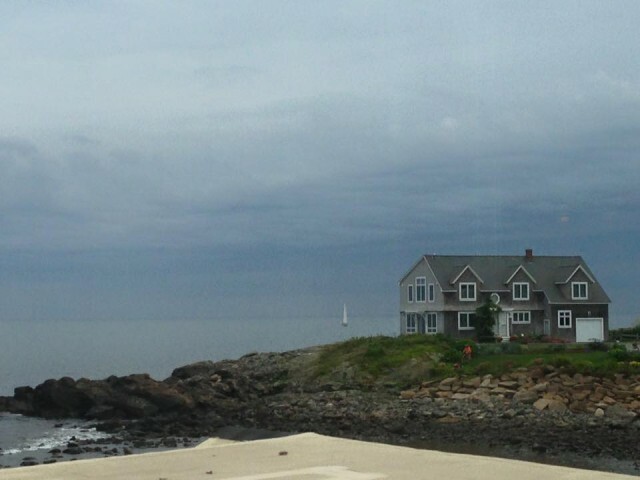 We landed in Portland and drove a half an hour or so to coastal Kennebunkport. I didn’t see the ocean until I walked into my hotel room and saw this view from my window…I had tears I was so happy to see it again and look how close it was? I couldn’t wait to dip my toes! The Nonantum Resort is a quaint inn. It looks like a big house from the front and oh so charming. Each morning you can eat a hot buffet breakfast and watch the morning sailers. My first full day was jam packed with fun. I’m going to start with lunch because it might have been my most favorite part of the whole trip and that is hard to say! 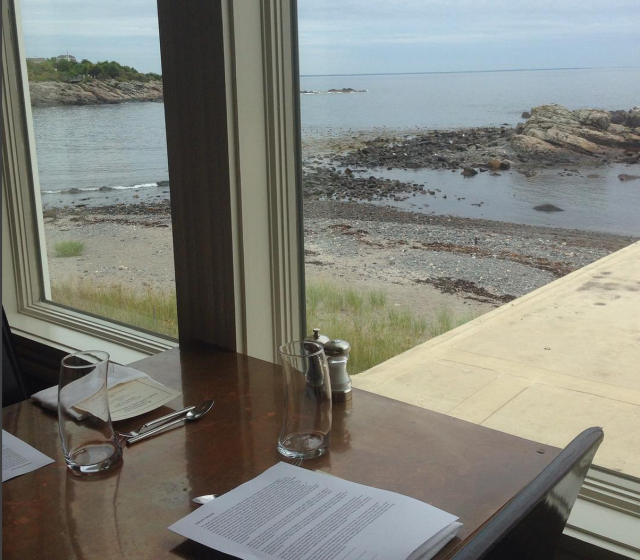 We drove a little ways to Ogunquit, Maine where we ate at a well-known restaurant called MC Perkins Cove. This is where I sat…and it was hard to bring my eyes inside! Beautiful right? The gourmet chefs/owners have had countless magazine articles written about them and are world travellers. To say the food was divine doesn’t even give it justice. We were served 5 mini courses that were prepared just for our group and I wanted it to go on and on. Soooo fun! Fun Fact – Tom’s of Maine employees use 5% of their paid work time to volunteer in the community so that is exactly what we did to work off our lunch! 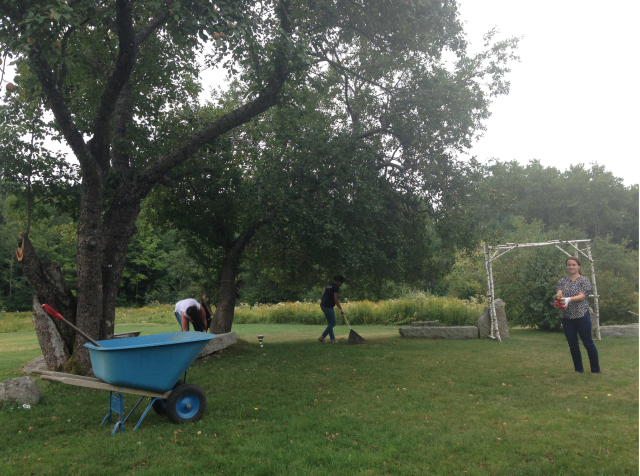 My group picked up dropped apples and weeded on a Land Trust that works on preserving natural spaces. I hadn’t had my Maine lobster yet so that night we dined at Mabel’s Lobster Claw where I had my first lobster roll and it was awesome!! Kennebunkport Maine is a home to George Sr & Barbara Bush, you could take photos of their compound, but we learned that they ate dinner in our same spot just 15 minutes after we left! I haven’t even begun to tell you how cute and historic ‘downtown’ Kennebunkport is. You could spend all morning going through the local shops and walking about the waterways. So much to see and so little time! 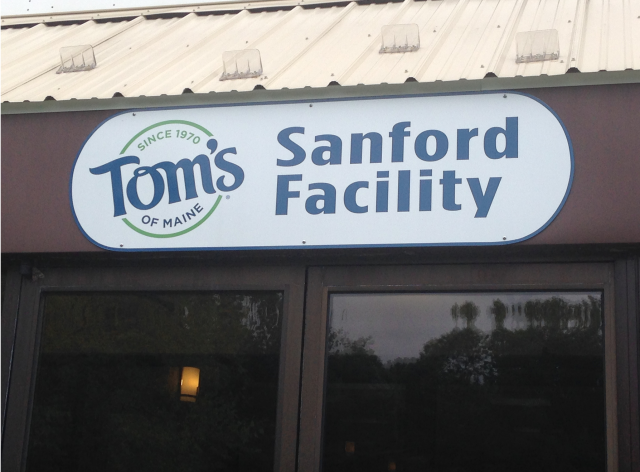 On our last morning we visited the Tom’s of Maine Factory. I was so excited! Fun Fact – the factory has produced 0% waste so far this year!!! Everything is reused and recycled down to the ends of the toothpaste tubes that are cut before sealed. You can imagine what strict factory policies that we followed – hairnets, long sleeves, ear plugs, no jewerly – but to me that was half the fun. We watched mint mouthwash going down the line and you should have smelled the whole building – minty fresh! We also saw the toothpaste line. It was suprising to learn that ALL toothpaste, deodorant and mouthwash is made here with only 62 employees including office staff. Can you believe it? Really the best part of my trip was just getting to know Tom’s of Maine and the people behind it. We met many of them over the course of a few days, but someone was always doing an activity with us – volunteering, eating, carting us to and fro – we were able to personally chat, ask whatever questions we would like (they asked us tons of questions too on how to be better! ), and learn what a fabulous company Tom’s has become over the years. They really are dedicated they are to making the world a better place for me, for you, and for our future children. 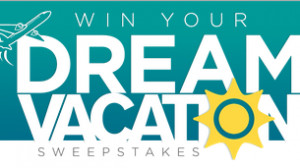 Check out TomsofMaine.com/company – click around and personally get to know them too. Read my post on Tom’s of Maine toothpaste and why I choose them first for my family. 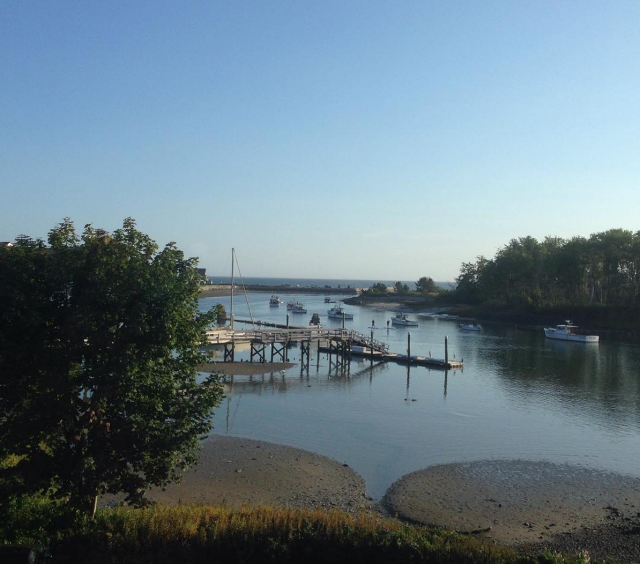 Have you been to Kennebunkport Maine? Are you familiar with Tom’s of Maine? I am part of the Tom’s of Maine blogger Goodness Circle. What a wonderful trip for you! I'm lucky enough to live in Maine, but I'm in the Downeast section, which is significantly farther up the coast from Kennebunk. I'm so happy that you enjoyed your trip--Maine is indeed beautiful. I hope that in addition to the obligatory lobster, you also got to enjoy some of the fabulous wild blueberries that are native here. Maine is my favorite place. When I visited there for the first time I definitely left a part of me. It's such a special place. Toms is awesome! Wow, what an awesome trip! I have always wanted to go to Maine. We were just talking about going to Acadia the other day!